Rotherham United midfielder Ryan Manning has a tried and tested method when it comes to taking penalties and he was not going to let a bit of pressure change it against Swansea City. 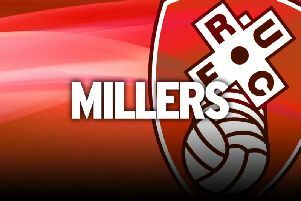 Manning was the Millers’ hero as he converted two spot-kicks in the space of nine crazy second-half minutes to give his side a 2-1 win that seemed impossible. There was never much doubt that both penalties were going to end up in the back of the net and the QPR loanee, who has received his first call-up to the senior Republic of Ireland squad for the internationals next week, became the club's top scorer with four goals - all of them from the spot. Having scored his first into the left-hand corner, which Swans goalkeeper Kristoffer Nordfeldt got a hand to, Manning was under intense pressure when the second was awarded with just three minutes of normal time remaining. Should he target the same corner? Which way will the goalkeeper go? And that is not mentioning the enormity of the result for his side should he convert. The 22-year-old could have been forgiven if he had indecision, but his second kick was even more emphatic, to the same corner but a bit higher up. Never in doubt. “I suppose it's like every penalty-taker says, just pick a side and don't change your mind,” he said. "If the keeper saves it, he saves it. If he doesn't, happy days. I do that with all my penalties - pick my side, hit it and hope it goes in. “The second one, I was going to change it. I had a few ideas in my head. Then I thought, 'You know what, same side and just smack it'. Manning first stepped up to the spot for the Millers in their memorable 1-0 win over Derby in September, which came a day after he won a training ground battle with Michael Smith. He had experience from his younger days in Ireland and was not going to miss the opportunity when it arose in South Yorkshire. “I've always been a penalty-taker,” he added. “I grew up in Ireland and whenever my teams got penalties I'd take them all. I never really had a chance, prior to coming here, to take penalties with QPR. We never seemed to get any.